Good morning. There's good news from China, for a change! Global stock markets are looking upbeat. 1. International markets overview: U.S. stock futures are pushing up and many European markets are rising by more than 1% in early trading. 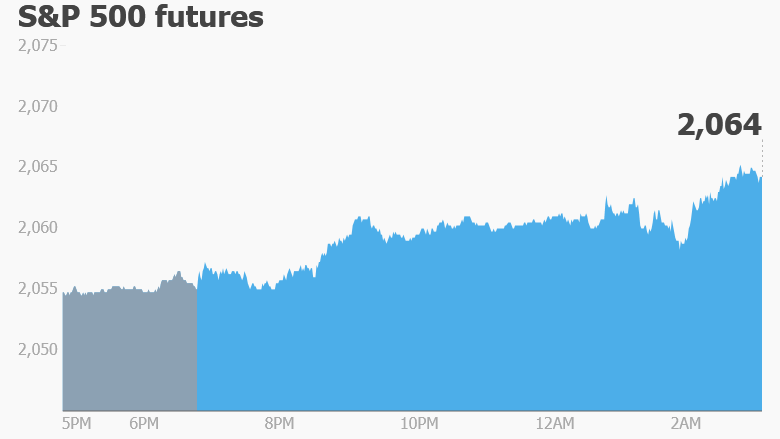 Asian markets got a boost after the release of better-than-expected Chinese trade data. But economists are keeping the champagne on ice since data from the first few months of the year tends to be volatile given it's a major holiday period. Experts will pay closer attention to first quarter GDP figures due on Friday. 2. Eyes on oil: Investors are watching oil fluctuations after crude prices hit a 2016 peak on Tuesday. Oil prices rallied above $42 per barrel based on reports that Saudi Arabia and Russia reached a deal to cap oil output. Crude oil futures are now dipping by about 1% to trade around $41.50. Major oil producers are slated to meet in Qatar on Sunday to discuss possible production freezes in an effort to boost global prices. 3. Companies to watch -- Peabody Energy, Verizon: Peabody Energy (BTU), the world's largest private-sector coal producer, filed for bankruptcy on Wednesday in a U.S. court, citing "unprecedented" industry pressures and a sharp decline in the price of coal. The company said it will continue to operate while in bankruptcy, and work to reduce debt and improve cash flow. Verizon (VZ) is in the spotlight as nearly 40,000 Verizon workers prepare to walk off the job at 6 a.m. ET if they have not reached a new labor agreement with the telecoms giant. The workers, who primarily service the company's traditional phone business, have gone without a contract since August, according to the Communication Workers of America. The union says it is fighting to prevent Verizon from moving jobs offshore or cutting benefits for injured workers. 4. Show me the money: Earnings season is gathering pace and JPMorgan Chase (JPM) is among a small group of companies posting quarterly results ahead of the open. 5. Wednesday market recap: The Dow Jones industrial average gained 0.9%, while the S&P 500 climbed 0.1% and the Nasdaq added 0.8%.